Leanne bakes: Happy Near Year! Happy New Year! I hope you all have a wonderful New Year's Eve. (I also hope you refrained from wishing people a Happy New Year's, unless you were specifically referring to that night and that night only). I had grand plans for Christmas and New Year posts, but have been sick with the plague since Boxing Day. So instead, let's take a look back at the 10 most popular posts from 2010. Pie Pops: How can little tiny pies on a stick go wrong? Vanilla cupcakes with the best chocolate frosting. Ever. Really. 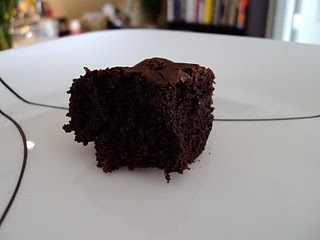 This still holds up as my favourite chocolate frosting. It has ganache in it! Wedding cupcakes with gumpaste roses and lilies: Classic and elegant. basically the opposite of me. Malted Brownies Chewy, fudgy, and perfect. Glazed and cinnamon sugar donuts: Tim Horton's won't give me ingredient information, so I just made my own timbits. And they're better. 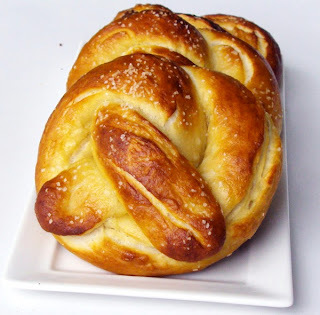 Soft Pretzels: These pretzels are making me thirsty! And some of you angry because of, you know, the swears. Lemon Raspberry Bars: God, these were good. Healthy Cinnamon Rolls: About as healthy as cinnamon buns can get! 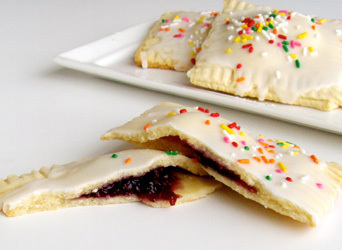 Homemade Pop Tarts: When life gives you allergies, make allergen-free foods. And why not take a look at the 3 biggest flops while we're at it? Brownie Fail. Misadventures with Murphy's Law and baking. Pretzel M&M cookies: Cookies taste better with risk of fire. A tale of two puddings: A tale on how, sometimes, it's important to just stick to what you know. It was, overall, a pretty great year, and I'm very glad to have shared with and learned so much from you all. Here's to another year of fantastic (and occasionally horrific) baking!